Take Highway 95 north of Quartzsite for about 6 miles to Plomosa Road, head east until you reach milepost 114 or 115 (you will see a sign directing you to the site), travel on the only paved road heading east for about 5 miles. Park in the graveled area. Starting Location: Meet 10:00 AM at the BLM Bouse Fisherman geoglyph site on Plomosa Road (paved) (see directions below). This is a fenced Indian geoglyph several hundred yards by easy trail from a BLM parking lot on Plomosa Road. Good meeting spot with big parking lot. DIRECTIONS TO SITE: Take Highway 95 north of Quartzsite for about 6 miles to Plomosa Road, head east until you reach milepost 114 or 115 (you will see a sign directing you to the site), travel on the only paved road heading east for about 5 miles. Park in the graveled area. 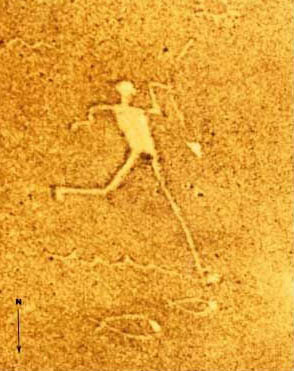 The site consists of one human figure geoglyph and a few other recognizable designs. The human figure with a spear in his hand, fish swimming below the water, and the sun shining above, creates a distinct image. According to Native Americans, this image may represent their Creator carving the Colorado River with his spear. Geoglyphs are difficult to date, so archaeologists have no way of knowing their age. An interpretive sign at the site provides additional information. Level of Difficulty: All attendees should wear appropriate footwear for light to moderate hiking. Guidebook and Snacks Costs: $30 (covers guidebook, some drinks (water) and snacks). Motel Accommodations and Meals: Saturday evening drive to Blythe, California, for dinner and hotel, or camp south of Blythe near Cibola Wildlife Refuge. There are 18 motels and a number of restaurants in the Blythe area. Saturday night campers - dry camp, no facilities, no fees. Participants will be responsible for their own motel accommodations and meals (2 lunches, 1 dinner, 1 breakfast, snacks, and water (drinks). Stop 1. Overview of Northern Plomosa geology from the parking lot. Stop 2. Barite veins and disseminated manganese mineralization in Miocene conglomerate. Stop 3. (optional) Iron-oxide impregnated and replaced Miocene carbonate and clastic sedimentary units. Stop 4. Stratigraphy of tiltblocks about the Plomosa detachment fault, and the appearance of mylonitic debris derived from the footwall block. Stop 5. Stratigraphy of the base of the Miocene section – basal conglomerate grading up into sand, silt, and limestone. Stop 6. Rock-avalanche breccia derived from metamorphic rocks that were subjected to hydrothermal alteration and later metamorphism, producing unusual mineral assemblages (including svanbergite). Stop 1. Hart Mine Wash – look at Bouse stratigraphy that reflects abrupt submergence of alluvial fans. Transgressive sequence includes nearshore carbonate facies (like the white bathtub ring around Lake Mead), offshore siltstone and clay. Discussion: paleontology, detrital zircon geochronology, and reason for inundation. Stop 2. 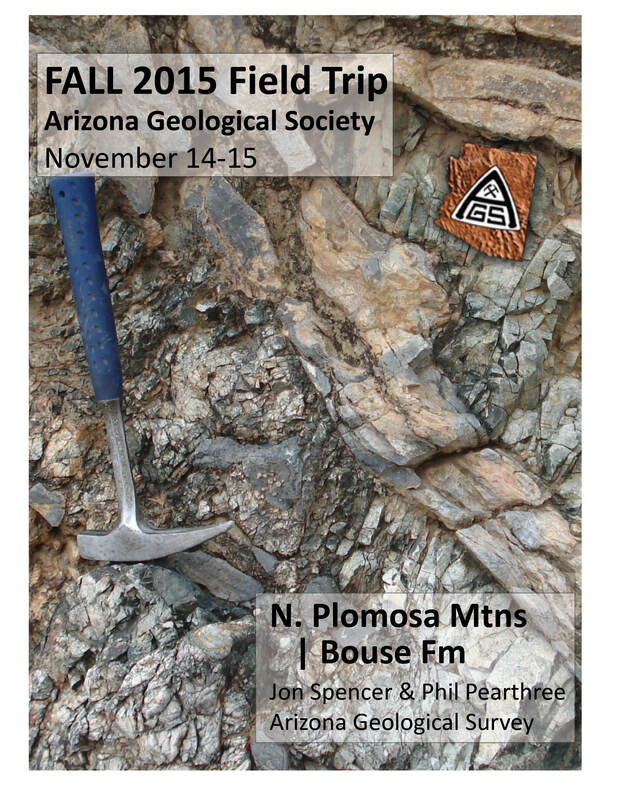 More Bouse Formation in the Cibola area – stop to be determined. Stop 3. Return to Blythe, take I-10 back into Arizona, turn off of I-10 at Tom Wells Road, go south to areas of historic manganese mining (Metate district) where manganese oxides fill fractures and pen spaces in rubble beneath Pliocene Bouse carbonates, and also affect the carbonates.